Adrenal fatigue is the hidden ailment. Hidden because doctors don’t know about it! The chances are that you have checked out the 50 symptoms of adrenal fatigue, or at least the 30 adrenal symptoms in the article. Chances are also good that you have several of those symptoms. It is truly a shame that doctors don’t know about this condition. There are so many people suffering needlessly simply because there is this huge gap in medical knowledge. My name is Kalidasa. I am a natural healer with a lot of experience in treating adrenal fatigue. And, almost every client I have ever seen had this condition. Finally I decided to write a book. My perspective on health and adrenal fatigue in particular, is pretty different from the usual. 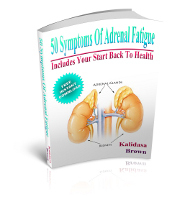 Everything you need to know about how to treat adrenal fatigue is in the book. I am confident that you will be able to get your adrenal glands on the road to full health as fast as possible. In fact, most people will likely find relief within a week of starting on the appropriate protocol for them. Plus, I will continue to write more on adrenal fatigue, and you will receive updates for free — be sure to sign up for them! This information is worth a lot to people that suffer from the over 50 debilitating symptoms of adrenal fatigue. Clients typically pay hundreds if not thousands of dollars to be treated. The cost of this material is much lower than that though. And, while this information that comes from years of experience and training is worth at least $50, you’ll pay a lot less today. In fact, until I get everything set up to sell this book the right way, the price will be a mere $7, much less than the final price will be. Just click the button and you can download your copy right away. The information is guaranteed for 90 days too. If you are not able to heal your adrenal fatigue then please email or call and I’ll refund you right away. PS. Just like everything else I offer, there is an unconditional 60 day money back guarantee.